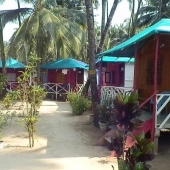 Palolem Beach, The beach with the longest history of tourism in south Goa, is the perfect Goa beach holiday destination for the tourist in search of a bit of action: water sports, night life and an enormous variety of dining and accommodation options to choose from. 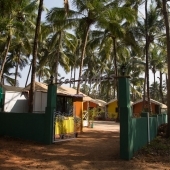 Although it is no longer the quiet, picture-postcard Goa beach that it once was before it was "discovered", Palolem beach is still a beautiful half-moon bay with clear, calm waters and an abundance of excellent restaurants and beach resorts for the discerning traveller. 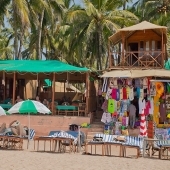 The once empty, palm-fringed sands of Palolem are filled with fishing boats offering dolphin viewing and day trips, jet skis, banana rides and other water activities. 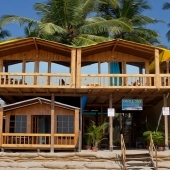 Excellent freshly cooked seafood is everywhere to be found and there are numerous well-run beach hut resorts, where one can find a beach hut on the shore with glorious uninterrupted views of the bay. 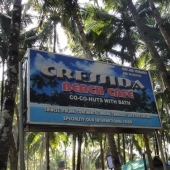 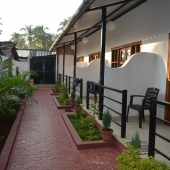 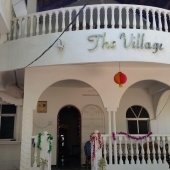 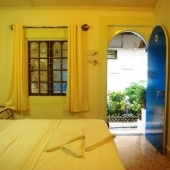 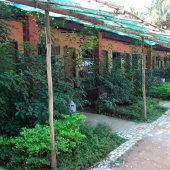 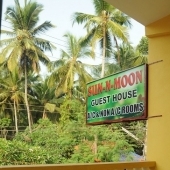 The centre of Palolem beach, where the main entrance is, is very busy and often overcrowded, but to the northern and southern ends it is possible to find pockets of peace and calm and some very beautiful beach hut resorts. 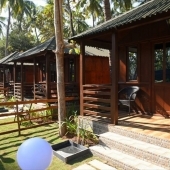 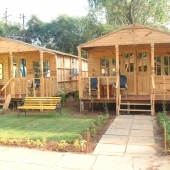 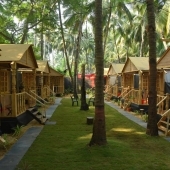 The northern end has a lovely tidal river which joins the Arabian sea, on which one can enjoy charming bird-watching boat rides, ideally suited to small children. 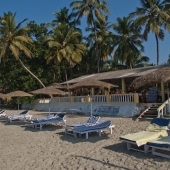 There is a great lookout point on the rocks on that end of the beach from which to catch a glorious Goa sunset. 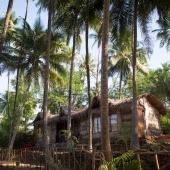 The southern end of Palolem beach ends in the famous Neptune's Point, a rocky outcrop that forms a divider between Palolem beach and Colomb Bay. 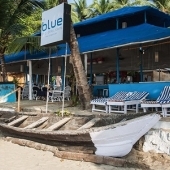 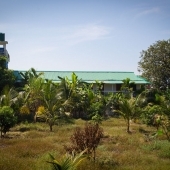 Neptune's Point is also home to Silent Noise, the famous weekly headphone party, where throngs of tourist flock to get a taste of party Goa and dance the night away to the sounds of trance, house and drum and bass. 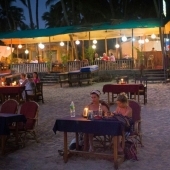 Alpha Bar, another late night spot which has a weekly headphone party, is also on the southern end of Palolem Beach. 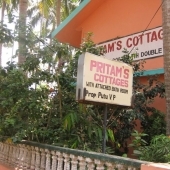 The main Palolem road is the best place for shopping in south Goa, with a variety of clothing and jewellery stores to choose from. 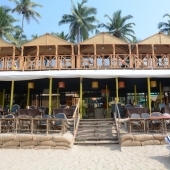 Bargains are easily had, and there are also plenty of good restaurants and even an ice cream parlour or two, to choose from.